Chocolates are not only famed for their exquisite taste and textures but they are also the symbol of love and romance. With their rich symbolisms and universal popularity, chocolates make perfect gifts too. 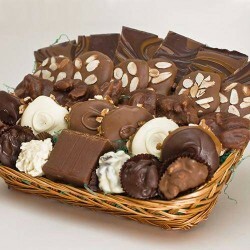 Everyone loves gifts in abundance and the more so with chocolates. Gifts of chocolate boxes containing assorted goodies of different variety of chocolates are one of the most popular gifts in the world. Square shape basket full of homemade dark chocolates. Give surprise to your dear ones by making it extra special via gifting online chocolate hamper by pairing up with Soft Toys, cake or flower bouquets.